Zoar Village is located in Ohio’s Tuscarawas Valley and was settled in 1817 by about 200 German emigrants seeking religious freedom. 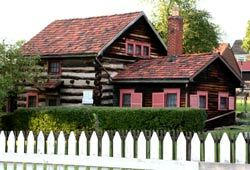 The Zoar community proved to be very successful in Ohio's rugged wilderness. This interesting experiment in communal living dictated that property and wealth was held by the organization known as the Society of Separatists of Zoar. 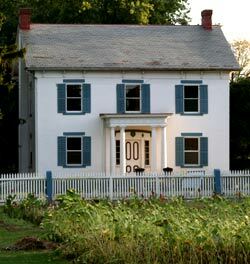 During the construction of the Ohio & Erie Canal, the Zoar Society also built 7 miles of the canal near their settlement. The Society of Separatists officially dissolved in 1898 and with this dissolution, the property was divided among its members. The restored village contains 10 buildings that are operated by the Ohio Historical Society and are open for public tours during regular hours. Other buildings are privately-owned, and serve as residences, shops, restaurants and bed and breakfast inns. Today, Zoar continues to be a popular tourist destination. Volunteers give craft demonstrations during the many yearly special events.The Zoar Community Association is a non-profit organization dedicated to the preservation and heritage of Zoar and it sponsors several events in Zoar, most notably, the Zoar Harvest Festival (held the first full weekend of August) and Christmas in Zoar (the first weekend in December). With nearly all of the buildings in the historic district original and beautifully restored the little village is a fantastic place to visit. The name Zoar was chosen by for the settlement after the account in the Old Testament where Lot went after the destruction of Sodom and Gomorrah. The Zoarites were originally from an area of Germany known as Wurttemburg. In the late eighteenth and early nineteenth centuries, they had separated from the official German religion, the Lutheran Church. Separatists faced severe persecution in Wurttemburg, including confiscation of their properties and imprisonment. The group's leader, Joseph Bimeler, decided to bring the separatists to the United States. The group first arrived in Philadelphia where the Society of Friends (Quakers) helped the separatists find jobs and eventually loaned them the money to buy about 5000 acres in eastern Ohio. Zoar Village is located about 15 miles south of Canton on SR 212, east of I-77. Nearby visit Warther's Knife and Carving Museum. The community of Zoar was not originally organized as a commune, but its residents had a difficult time surviving in 1818 and early 1819. As a result, on April 19, 1819, the group formed the Society of Separatists of Zoar. Each person donated his or her property to the community as a whole. In exchange for their work, the society would provide for them. Both men and women signed the original document creating the society. Women had equal access to political leadership and had the right to vote in elections. Women also were not prohibited from holding office in the society, although no women were ever elected to these positions. Additional modifications to the society's organization were made in 1824 and a constitution established in 1833.